"NO! I can't become a pervert like him and think like that!" He spazzed with a (T_T) face for lack of a better description. Lenalee held back yet another laugh. "Well, how about we get some steamed pork dumplings?" she asked, not really sure what this bar had, but that was one of her favorites. "'Course not, kid. I don't even know where you live. Plus, that's freakin' creepy," Axel turned to grin at the green haired girl. "Suure." He smirked before ordering steamed pork dumplings. "Thank you very much," Lenalee said, taking one of the dumplings and taking a big bite out of it. "It's delicious! You two have to try these!" Axel grinned before taking one of them, taking a bite out of it, impressed. "Wow! It is good," He smirked before eating more of it. "You should try one too," Lenalee said, offering one of the dumplings to Misaki. "They're really good." "Uh...no thanks," He wasn't into that type of food thanks to Usagi-san. He always made strange comments about certain types of food, so ever since he heard something about pork he refused to eat most pork products, "I'm not into pork..." He said, he finally decided to take a seat. "That's fine," Lenalee said, putting the dumpling back. "Do you not like the taste or is it for religious reasons?" "No...not those reasons at all," He said, deciding not to cover up Usagi-san's nickname, "I was fine with eating it until I met Usagi-san and he made a comment or two about pork...in general...."
"Ohhhhhh. I understand. Just don't tell me them because I like pork." Lenalee smiled and took another of the buns. "My brother's a little like that sometimes, too, so I really do get it." "Well. I'm a person that just doesn't give a damn!" 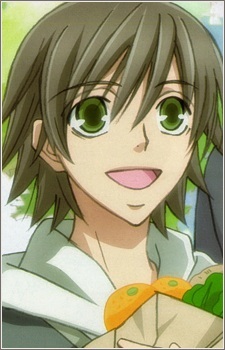 He grinned, turning to Misaki. "Then what would you like? Hmm?" He really wanted to be kind, since he was bored, of course. "Umm.." He blinked at the weird food before grinning. "Sure!" He quickly ordered the hash-browns, really craving some all of a sudden. "Oh! That sounds yummy, too!" Lenalee commented, though she was already full from the steamed pork buns. "With some ketchup, or maybe some cheese on it too. Then it'd be like french fries or tator tots." "On the side though. I don't really like to add stuff to other things. I usually like everything plain. I mean, if you put ketchup and cheese on it, you taste more of that then the actual potatoes. I like the actual meal at full taste. But, that's just me in general I guess. Usagi-san likes to put all sorts of toppings on his food." "You must really like this Usagi-san person. All you do is talk about him," He grinned, placing the basket of hash-browns in front of him. "Here you are." "I don't like that perverted, stupid, pig-headed, selfish, mean, and absolutely stubborn man," He said, naming off all of the things he could think of. In the end, he did like Usagi-san, but he would just never admit it out loud, "he just lives with me so I know him well, that's all." He said, beginning to munch on hashbrowns. "Your blushing face says different." The red-head smirked, picking up a hash brown. He got a bottle of hot sauce and poured some on his hash brown before taking a bite. "No no no! You got the wrong idea! Usagi-san is ten years older then me! It's not like that! I'm not gay!" He said, he would never admit it unless it was just himself, but he was gay. It was as if half of him could except it, but the other half of him could not. Lenalee resisted the urge to tease him some more. It was like talking to a more happy-go-lucky and energetic Kanda. After all, both adamently refused they liked other men despite their crushes being obvious--if only to her, in Kanda's case. "Being really good friends with a guy doesn't make you gay," Lenalee informed them both with a small, knowing smile. "And being gay isn't really that bad. I mean I'm bisexual, and I'm pretty damn proud of it." He took a bite of his hash-brown. "I mean, if you like someone, you like them. Regardless of gender, that is." He grinned, he actually sounded smart for once. "No no no! It's not that! It's just the fact that it's USAGI-SAN! I mean, he used to love my older brother, he's ten years older then me, he-" Misaki cut himself off, deciding not to include that Usagi-san had molested him when they had first met, "he's just...Usagi-san. Pervert Usagi-san." "Ooooooooh," Lenalee said, understanding. "Are you afraid he's only interested in you because you remind him of your brother?" "I...I don't want to be compared." Lenalee nodded, completely understanding. "I don't think he would. If he really loves you, he won't try to compare you. And if he does, you tell him you don't like it."